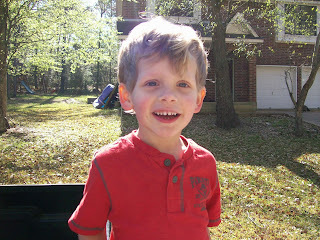 A few pictures of Dawson outside enjoying the beautiful Spring weather. Posing in front of the great state of Texas. 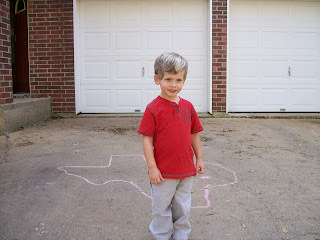 Dawson definitely knows the Texas shape - he'll point it out on license plates, road signs, etc. He's only 3 and already a proud Texan! Smiling as he climbs on the truck. 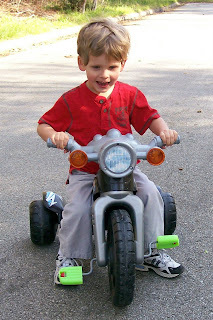 Cruisin' on his motorcycle. Although he knows how to pedal, he still seems to prefer pushing with his feet, probably because he can get around faster that way. 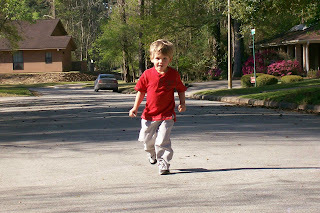 Having a good time running up and down the street.